Last month, the International Construction Measurement Standards Coalition (ICMSC) launched a standard intended to harmonize cost, classification, and benchmarking definitions across the construction industry. Digicon Information, an Alberta-based provider of master specifications, software, and building information modelling (BIM)-related resources, has been acquired by NBS, a global source of construction information and knowledge management services headquartered in the United Kingdom. 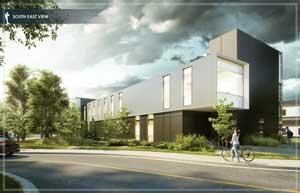 Rendering of a proposed new glass-and-steel structure at the University of Toronto Mississauga (UTM), Ont. The University of Toronto Mississauga (UTM), Ont., will add another building, a two-storey glass-and-steel structure, along the campus’ “pedestrian spine” in spring 2019. The 845-m2 (8000-sf) structure will house the campus’ police services, and hospitality and retail operations. The new administrative annex will be located near the existing academic annex, and the two buildings will share a small courtyard and garden. Architectural firm WZMH will use an innovative prefabricated method to achieve high-quality construction in a very short time frame, said Stepanka Elias, director of operations, design and construction in UTM’s department of facilities, management, and planning. “The building will be visible as soon as people arrive at the bus stop outside the Kaneff Centre and will provide a warm welcome to UTM. It will form part of our attractive pedestrian walkway that runs past the student centre and CCT Building, ending at the library on the other edge of campus,” she added. The project is currently under review by the City of Mississauga and awaiting site plan approval. Got News? Click here to share your story!